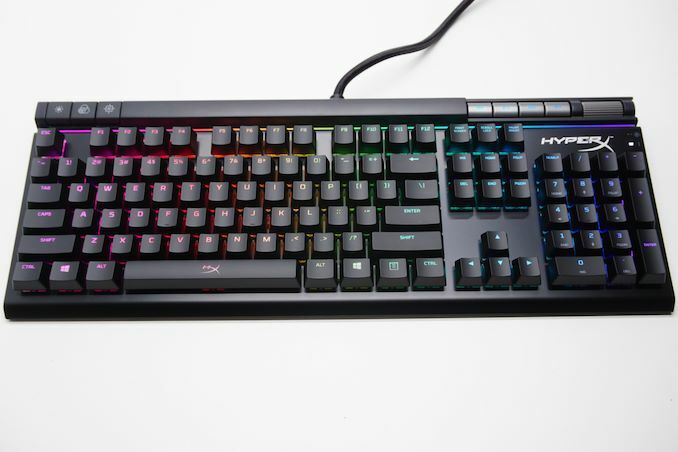 HyperX's Alloy Elite RGB features a clean and simple design, without complex shapes, granting the keyboard a subtle appearance - as long as the LED lighting is turned off, at least. 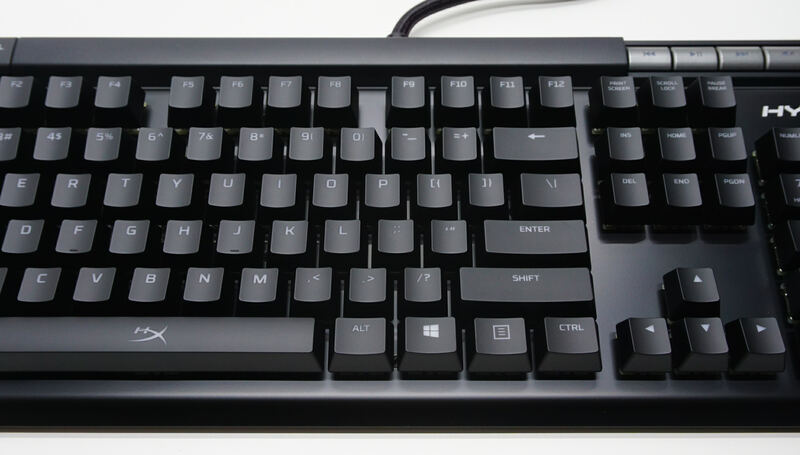 It features the classic design of standard-height keycaps floating above the top aluminium cover of the keyboard. A closer look reveals that the top part of the keyboard that hosts the extra buttons and the sound volume wheel is actually plastic, but it still visually merges with the aluminum part of the keyboard perfectly. The HyperX Alloy Elite is a design that can be easily underestimated at first sight. The floating design and height of the keycaps instantly hint that this is a classic mechanical keyboard, yet it takes an experienced eye to discern that the top cover of the keyboard is solid steel, not plastic. Meanwhile compared to past products, we can see that aside from the aesthetic design changes, the top bar of the keyboard and the several extra buttons and wheel that it hosts is the primary difference over the previously released Alloy FPS. We received the US layout version of the HyperX Alloy Elite RGB. 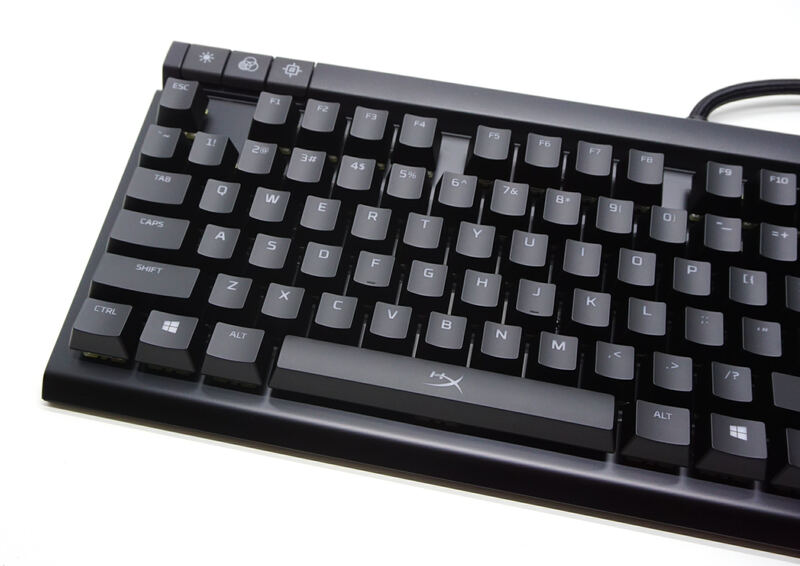 The main part of the keyboard is a standard 104 keys design that fully adheres to the ANSI layout, with a 6.25× space bar and seven 1.25× bottom row keys. HyperX etched their brand logo on the space bar key. The characters on the keycaps can both be found at the top half of the keycap, where the backlight LED of each switch is. Aside from the standard keys, the Alloy Elite RGB features another seven low-profile buttons and a sound volume control wheel, which can be seen placed across its top side. There are three buttons to the left side, with two allowing for on-the-fly lighting adjustments and one enabling the “game mode”. By default, the “game mode” simply disables the Win keys, but its functionality can be adjusted via software. The four buttons to the right side are used for basic multimedia functions (play/pause, back, forward, and mute). There are three indicative LEDs placed under the sound volume control wheel, across the right edge of the keyboard. Two of them are the classic Caps Lock and Num Lock indicators, while the third indicates whether the “game mode” is active or not. 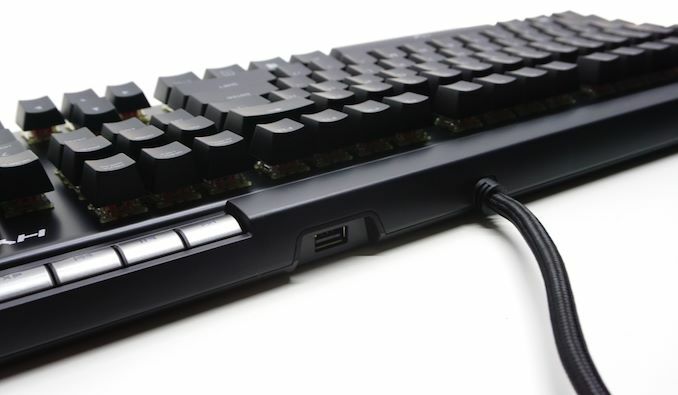 HyperX cleverly placed a USB 2.0 port on the rear of the keyboard. It can be found just a little to the right of where the F12 key is. This port is primarily meant for wired gaming mice. Of course, any kind of USB device can be connected to it but it will be very slow for modern storage devices. 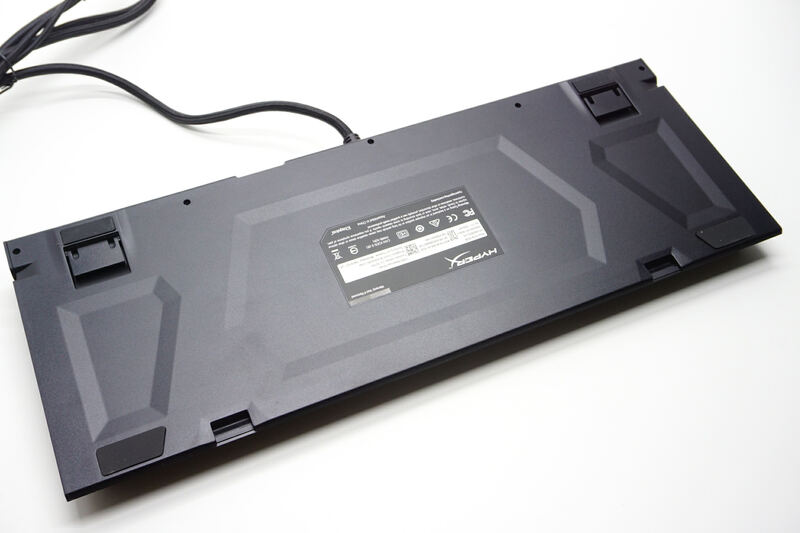 Beneath the keyboard we can only see four large anti-skid rubber pads attached to the keyboard’s edges, as well as two legs that give the keyboard a fixed tilt. The plastic bottom of the keyboard features embossed shapes, as if the designer made an attempt to make it more attractive, even though very few people would actually see it. Under the hood of this model, HyperX is using genuine Cherry MX RGB switches. We received our sample with Red linear switches, but HyperX offers the Alloy Elite RGB with other Cherry switch types installed as well. 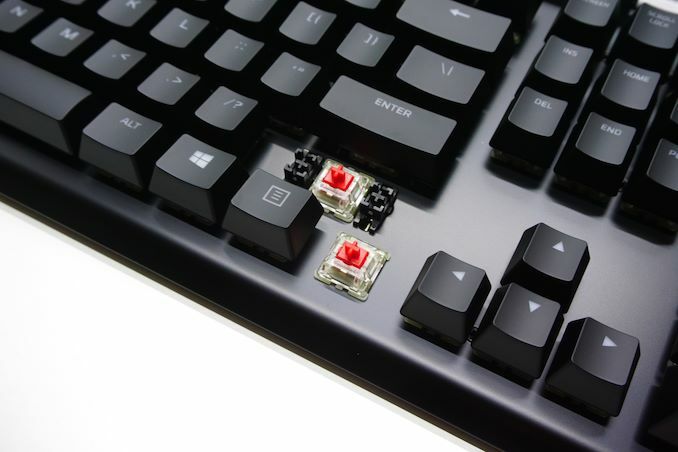 The RGB version of the Cherry MX switch features a clear frame that diffuses the lighting, distributing the light almost evenly around the entire keycap. Cherry’s cross-type supports can be seen beneath the larger keys. 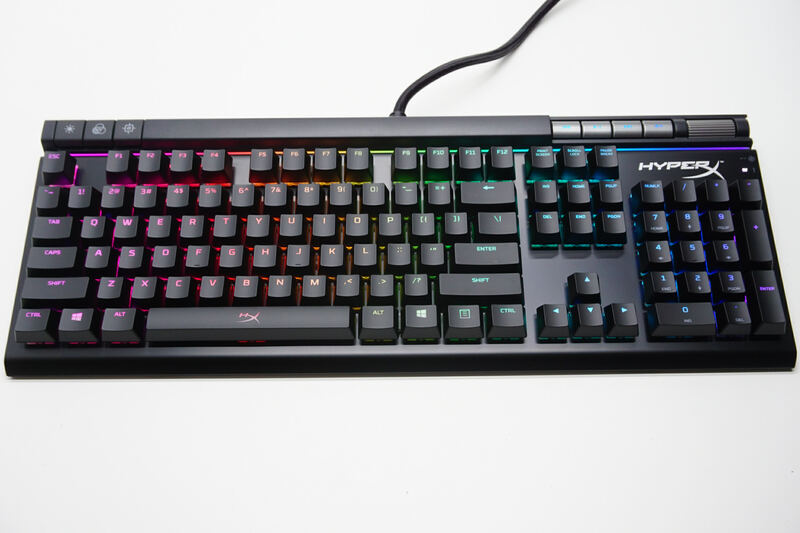 While not the only new feature on this keyboard, the RGB lighting probably is this keyboard’s primary selling feature and HyperX is focusing their marketing efforts on it. True enough, the lighting is exceptionally applied, with vivid colors and excellent distribution. The keycap characters are clear and bright, including the lengthier etchings on the larger keys. 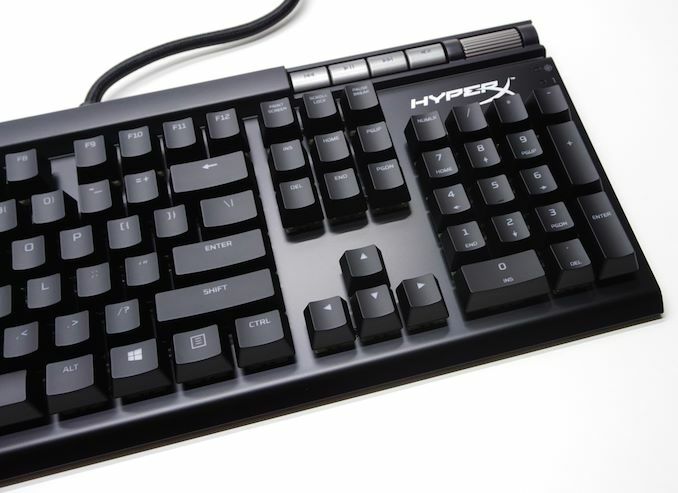 HyperX also placed a so-called “light bar” near the top of the keyboard, right where the aluminum surface ends and just below the extra low-profile buttons. This light bar currently has no practical purpose, although it could potentially serve as a meter or some other kind of indicator for games via a future software upgrade. The removal of the keyboard’s plastic bottom cover reveals the large PCB that is permanently joined with the aluminum top frame via the keys. Smaller secondary PCBs are being used for the extra buttons and for the USB port. The keyboard generally is very sturdy but the top plastic parts obviously are significantly weaker than the rest of the keyboard and should not be mistreated. 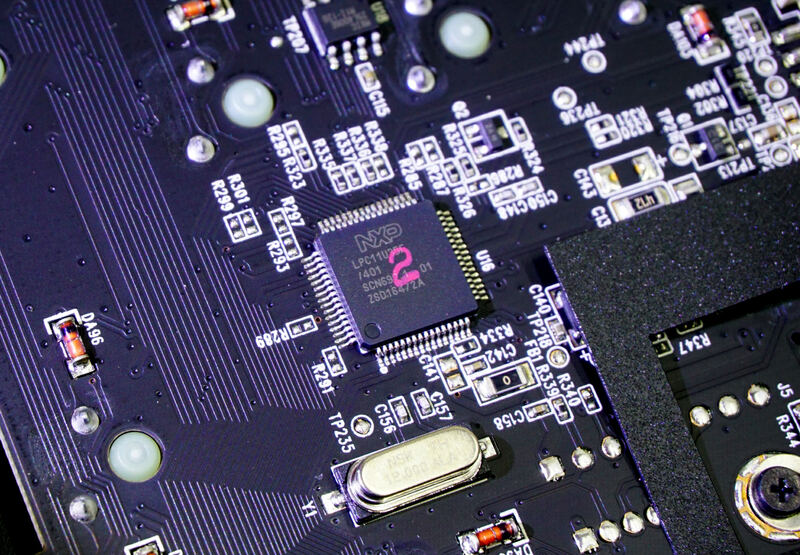 HyperX placed an NXP LPC11U35F microcontroller at the heart of the Alloy Elite RGB. It is a 32-bit microcontroller with a CPU frequency that can reach up to 50 MHz and 64 kB of flash memory. It may not be the fastest microcontroller that we ever found on a mechanical keyboard but, considering the features and capabilities of the Alloy Elite RGB, it certainly is up to the task.